Most people agree that linen was the original woven textile. Remains of primitive linen production have been found that date back 36,000 years. 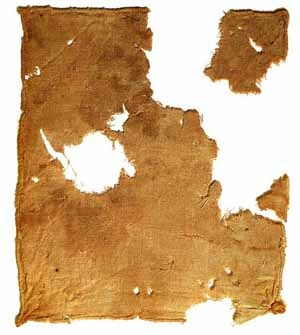 The piece in this picture is said to be 7,000 years old, and the oldest piece of textile to exist. Visit any major museum and you will find ancient linen garments. The point is: linen has a long life span. Before the wide use of cotton, most clothing was made from linen. In my mind, it remains one of the best and most versatile textiles for clothing and home use. Why did linen fall out of favor? I have my own theories. One is that linen was more expensive than cotton. Another is the introduction of polyester in the 1950’s. Prior to that, we washed and ironed our clothing and home textiles. Suddenly, you could throw everything into a washing machine and dryer, and everything came out ‘ready-to wear. We developed a collective rejection of wrinkles! Linen wrinkled. Wrinkles were not “modern”. In my mind, we gave up a lot when polyester was introduced. 1. We moved away from natural fibers to ones that were produced with petroleum based products. 2. We lost the knowledge of how to clean and care for natural fibers. This “tribal knowledge” was handed down over the centuries and was lost in 2 generations. One of the most common questions we are asked is “can I wash this?” We have forgotten that EVERYTHING was once washed! There was no drip dry and there were no dry cleaners. 3. The top on my list: we gave up the human satisfaction that comes from living with and wearing natural fibers. Natural fibers do not hold odors, stains can be removed more easily, they last longer, BUT they take more care. The last 50 years has been dedicated to doing things faster but not better. Back to linen. The manufacturing of raw cotton into cotton yarn is a tremendous global pollution problem. The production uses enormous amounts of water. The chemicals employed for most cotton production poisons the land and water supplies. Linen production, on the other hand, is relatively low tech. In addition, linen is naturally anti microbial, which means that it does not “sour” like cotton. If you have a linen towel and a cotton towel in your bathroom, the linen one will smell fresh for a very long time. The same goes for linen clothing. Linen is particularly well suited for hot and humid climates. Linen has a very long life span. It is more difficult to tear or rip than cotton. However, we are experiencing a shift in recent times. It started in fashion with 100% linen fabrics and a deconstructed point of view which turned seams inside out to expose fibers and threads as something to be admired. The modern consumer became attracted to the aesthetic of natural fibers and inherent wrinkling, or at the very least, a “non artificially smooth” look. The result is that Anichini is receiving more and more requests for linen sheeting, linen towels and linen decorative fabrics. Fortunately, I have long been a fan of linen, we have many offerings in our collection.